Your garage does a lot for you. It saves you from scraping your car each morning. It has your back when you need to store tools and outdoor supplies. It even helps reduce your heating and cooling costs when it has an insulated door (read more about that here). 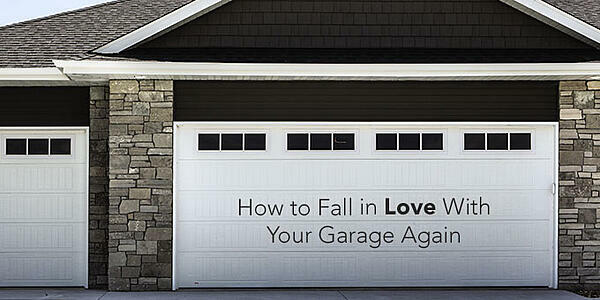 Show it some love this year by making it the best garage it can be with new paint, new organization or even a brand new door. Transform the look of your garage. A little paint goes a long way to improving the look of your garage. Freshly painted white walls helps create a clean, bright space. Epoxy kits make dingy, stained concrete look like a showroom floor. And many of these kits leave a finish that’s easier to clean compared to bare concrete and resists stains, chips and abrasion. Don’t forget about the door. A coat of paint gives most garage doors new life, especially an older door that you’re not quite ready to replace. Try a bold accent color or harmonize with your existing color palette. The options are as endless as there are hues available. Make the space work for you. A well-organized garage not only looks great but functions great. You’ll spend less time searching for tools you need and more time getting chores and projects done. Clear out clutter and garbage then sort your “like” items together (tools, gardening supplies, pet care, car care, etc.). Install storage options like wire shelving for easy-to-grab items and wall hooks to hang ladders and hoses. Don’t forget to utilize the ceiling to hang bicycles and water equipment (canoes and kayaks) from. Take a look at what we can improve. Our design center shows you what a new door or new features would look like on your garage. It is easy to try out. Take a clear, bright picture of your home with the garage door in full, unobstructed view. If you can’t wait, you can use one of the template homes. Go to our Design Center. Select a garage door shape like square or curved. Customize your garage door with your favorite colors, windows, glass, hardware and appropriate door size. Not sure of your size? Single doors are commonly eight or nine feet wide with a height of seven or eight feet. Double doors are most often 16 feet wide and seven or eight feet high. But, measure your door to be sure. Save your design, print it out and share it with those whose opinions you trust, be it your spouse or social family. We can help make your Sioux City or Yankton garage your favorite place again. Contact us to ask about the latest and greatest in garage doors.